Harmony Homes’ Daybreak at Sunrise Highlands has few lots remaining, according to Harmony Homes President Robb Beville. Courtesy photo Harmony Homes’ Daybreak neighborhood features two models, including this one with 1,739 square feet. Daybreak is near Royal Links and Stallion Mountain Golf clubs, Hollywood Regional Park, the Clark County Wetlands Park and the Sunrise Trailhead, which links to the River Mountains Trail Loop. 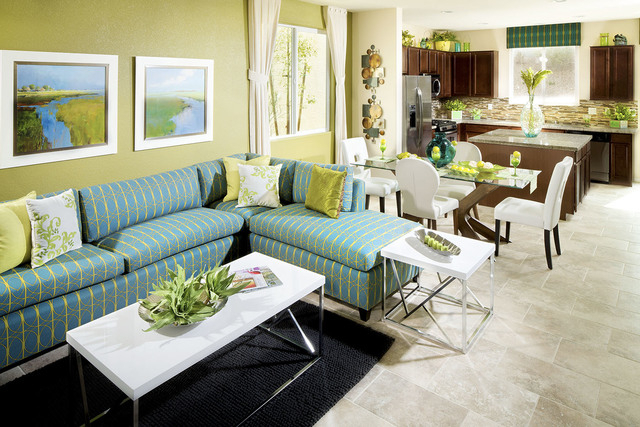 Daybreak features two models and three floor plans ranging from 1,739 to 2,275 square feet, starting at $195,990. All three floor plans are two-story. Floor plans feature gourmet kitchens and oversized master bedrooms. The 1,836-square-foot plan was designed with a courtyard at the front. It also offers an optional fourth bedroom downstairs. Homes are part of the builder’s five-star energy certification that includes energy-efficient features such as radiant barriers to help reduce heat transfer through the roof and attic; Low-e windows that help reflect heat away from the glass; vinyl window frames for superior insulation; and 13 SEER (seasonal energy efficiency rating) heating, ventilation and cooling systems that hold the government-recommended 13 rating. The homes come standard with tankless water heaters. Daybreak homebuyers also get solar energy systems as a standard feature through SolarCity. Sales offices are open daily from 10 a.m. to 5 p.m., except on Monday, when they open at noon. For more information, call 702-527-7700, or visit www.harmonyhomes.com.